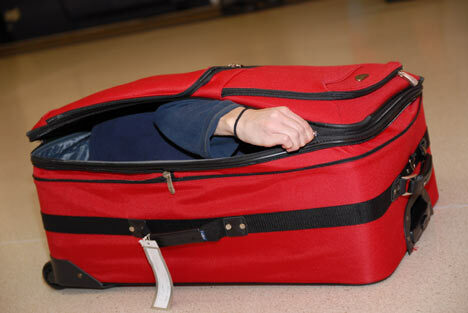 A man has been arrested in Spain after curling up inside a large suitcase that was placed in an airport bus cargo bay and sneaking out to steal from other people’s luggage. A police official in the north-eastern Catalonia region said on Thursday that the man arrested last week was very thin. Also arrested was an accomplice who placed the contortionist thief inside the cargo hold of a bus running from Girona airport to Barcelona, boarded the bus and then retrieved him at the end of the line. During the 60-mile (100km) ride, the thief would slip out of the suitcase and use a sharp object to pick locks or open zips to steal from bags. Police were alerted by bus passengers who reported items stolen from their baggage. Contortionist = A person who performs gymnastic feats involving distorted/abnormal positions.